Central Tapanuli (Tapanuli Tengah) is not as famous as the other regions in Indonesia for its tourism sector. 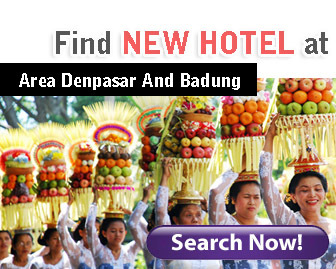 This regency is located in the North Sumatera Province. Actually, Central Tapanuli has the right potential to be a good tourism area. Thus, this province is still developing that potential and also still keeping up the promotion of their tourism objects. Here are some of the interesting places that could be visited in Central Tapanuli. Mursala Island is a tourism object located in Tapian Nauli District, Central Tapanuli Regency, North Sumatera. This island’s area is 8,000 hectare, which consists of beautiful hills. In Mursala Island there are some rivers flow cleaving the island. The sea around Mursala Island is used as the conservation place of coral reef. Meanwhile, its island has the potential to be a place for relaxing resort and hunting spot. If this island is reached from Sibolga Town, it will need around 1 hour trip using speed boat, or 3 hours using a normal boat. An interesting place that you may need to visit in this island is a unique waterfall on the edge of this island’s cliff. The water from this waterfall directly falls into the ocean. 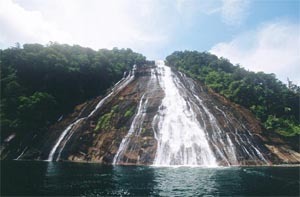 If you are interested in visiting this waterfall, you can rent a boat and observe the beauty of it directly on the sea. Anugerah Hill is located in terdapat di Bonan Dolok, Sitahuis, Central Tapanuli. Because of its topography, the visitors could enjoy beautiful panorama of this area from the highest place which is located on the height of 1,500 m above sea level. 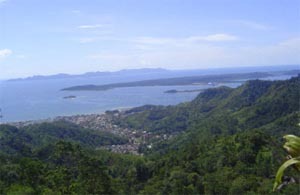 From there, you could see the panorama of the surrounding islands, sea, Pandan Town, and Sibolga Town. It is informed that in this area, a great statue will be built which is called Anugerah Statue. The plan is creating a Prophet Noah statue standing tall in a hotel in form of a big ship. Now, this statue is still in the process of making in the workshop of a famous Balinese sculptor, Nyoman Nuarta. If this plan goes well, the height of this statue will be higher than Liberty Statue in USA. The hotel itself is designed to have 200 rooms, ballrooms, and completed with unique architecture designed by the team of Nyoman Nuarta. Pandan Beach or also called Indah Pandan Beach is one of the favorite tourist destinations in Central Tapanuli. This tourism object is located in Pandan Village, Pandan District, which is the capital of Central Tapanuli. This beach offers a great natural panorama. The location of this beach is in a form of a bay, so the wave is quite calm and suitable for swimming and playing around this beach. Some water sports are also available such as banana boat or inner tube which could be rent for relaxing on the water. In Pandan Beach there are also some inns, souvenir shops, and restaurants where you can taste various kinds of traditional food with cheap prices. 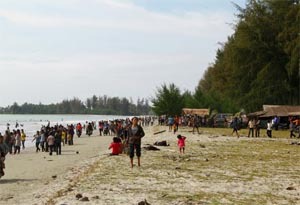 The location of Pandan Beach is adjacent to the main road of Pandan and Padang Sidempuan. It means that this beach is easy to be found. Besides that, because of its easy access this beach could be visited by private vehicles as well as big public transportation such as bus. This beach is very crowded in the weekend when the people are having holiday with their family. 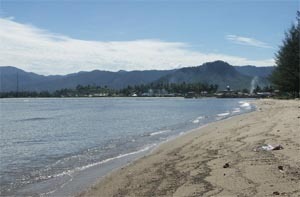 Kalangan beach is not too far from Pandan Beach; approximately 2 kilometers. The beauty of this beach is not inferior to the Pandan Beach, with green hills surround the blue ocean. Moreover, in the western part of this beach there are a lot of rocks emerge from the water. Those rocks have been becoming favorite spots for fishing by the local residents. 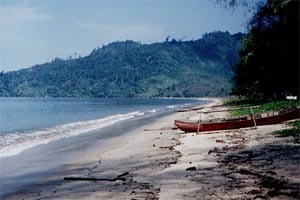 This beach is indeed a popular beach amongst the citizen of Sibolga Town. Various sport events have been hold in this beach such as swimming and motorcross competition. Besides that, many shows and entertainments are usually held in this beautiful beach. This beach is very exotic, attractive and its charm is truly enormous. Many people say that Kahona Beach is as good as the famous beaches in Bali or even in foreign countries. Because of its beauty, this beach was used as the shooting location of a film entitled mursala which is intentionally created to expose some interesting places in Central Tapanuli. Its turquoise water which is surrounded by beautiful hills makes this beach’s beauty very attractive for the tourists. The exoticism of Kahona Beach has made this beach as one of favorite holiday destinations in Central Tapanuli. However, its infamous name outside Central Tapanuli results a lack of visit from the tourists of other regions in Indonesia and also foreign countries. However, with the local government’s commitment it is expected that this beach could be revamped and developed so that its great potential could attract foreign tourists.